Here is a little treat box I made for my daughter. Very easy box to assemble. I dry embossed the roof then added Glossy Accents over the web as well as the window trim and fence that wraps around the back and side of the house. What a fun little box..love the glossy web on top. Your Daughter is so lucky Nana,this is gorgeous I like the web on the top and of course the candy inside. What a fabulous treat box, Nana!! I love the glossy accents over the spider web!! The button door handle is so clever!! The back of the house is as adorable as the front.And let's not forget the Cutie pie of a button! !YOU ARE AWESOME!! !But I bet you already know that!!LOL.. This is so cool... love that box! Love it! Also love the cute blog design for Halloween. Super cute treat bag. I sure your daughter will love it oh and the cadny too lol. Good luck with the challenges. cute, cute, cute...love that spider web! I LOVE this!!! I just bought this set and can not wait to start cutting out the fun files!!! LOVE the spider web and the fence cut so beautifully! Awesome job!!! I love this! It looks yummy! Ditto from above. I love it. What an awesome project. 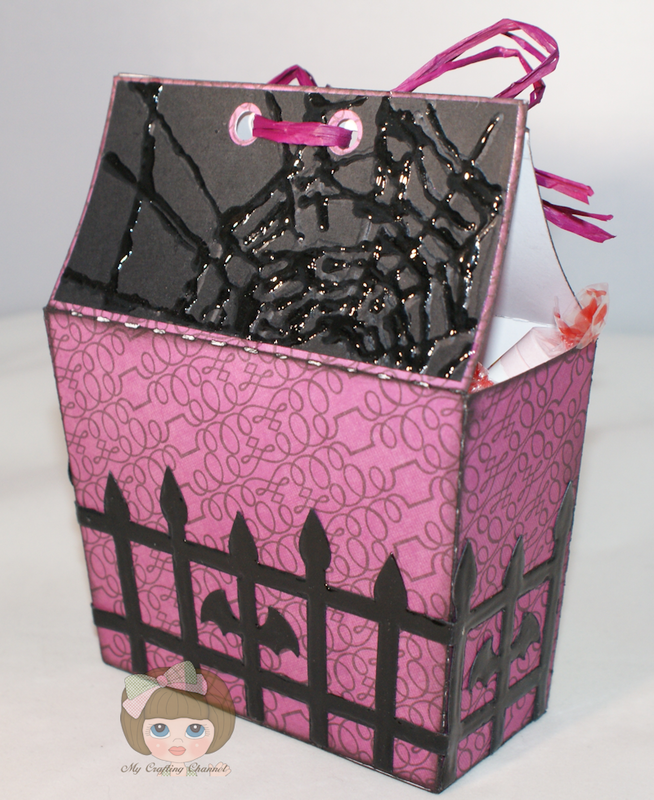 I love how you highlighted your embossed spiderweb with glossy accents. 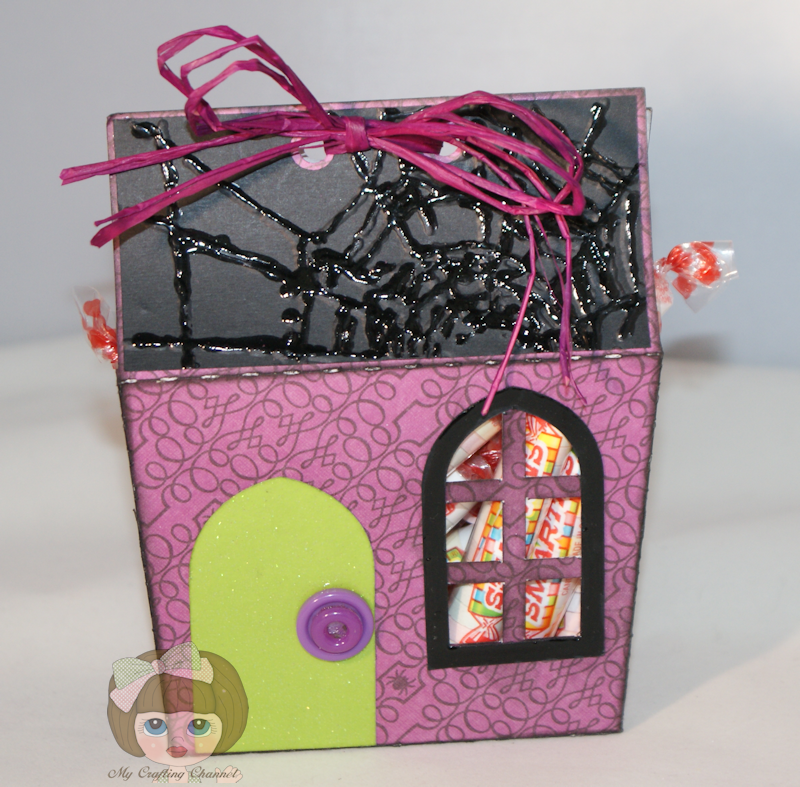 Thanks so much for participating in the Crafty Friends Challenge. I came back to look at the haunted house and the purple raffia almost looks like a spider. Just love this! I really like your choice of paper, the glitz & functionality of it. You can place treats of all kinds in them. Oh how adorable! Thanks for playing along! really cute house! love the idea of using it as a treat box.